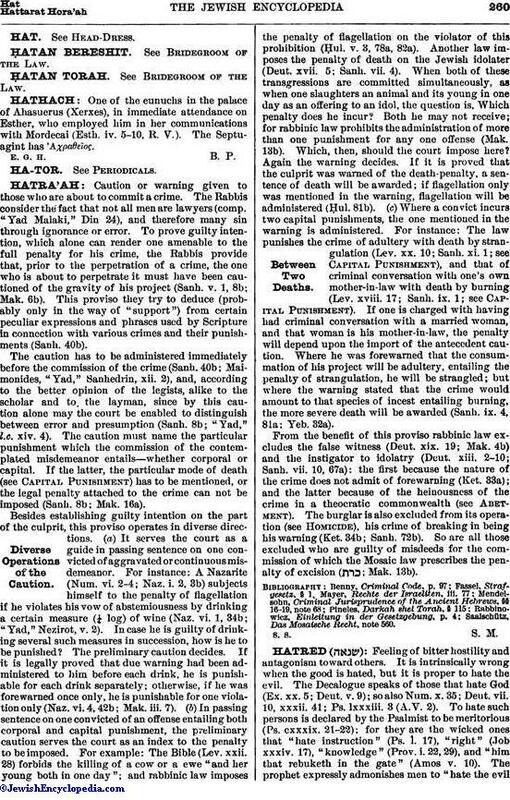 From the benefit of this proviso rabbinic law excludes the false witness (Deut. xix. 19; Mak. 4b) and the instigator to idolatry (Deut. xiii. 2-10; Sanh. vii. 10, 67a): the first because the nature of the crime does not admit of forewarning (Ket. 33a); and the latter because of the heinousness of the crime in a theocratic commonwealth (see Abetment). The burglar is also excluded from its operation (see Homicide), his crime of breaking in being his warning (Ket. 34b; Sanh. 72b). So are all those excluded who are guilty of misdeeds for the commission of which the Mosaic law prescribes the penalty of excision ( ; Mak. 13b).